This topic is for discussion, fotos & videos of Nest#24. 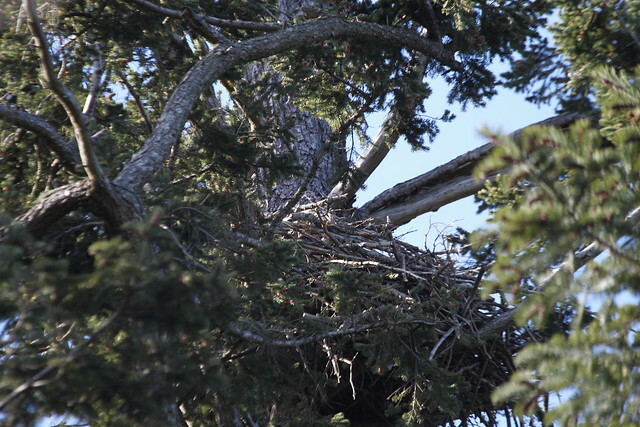 Last season, we observed one Eaglet in this nest. Here is winterwren*s map of the Hornby nests, so that you can see where it is. Here is the second edition of my nest map. 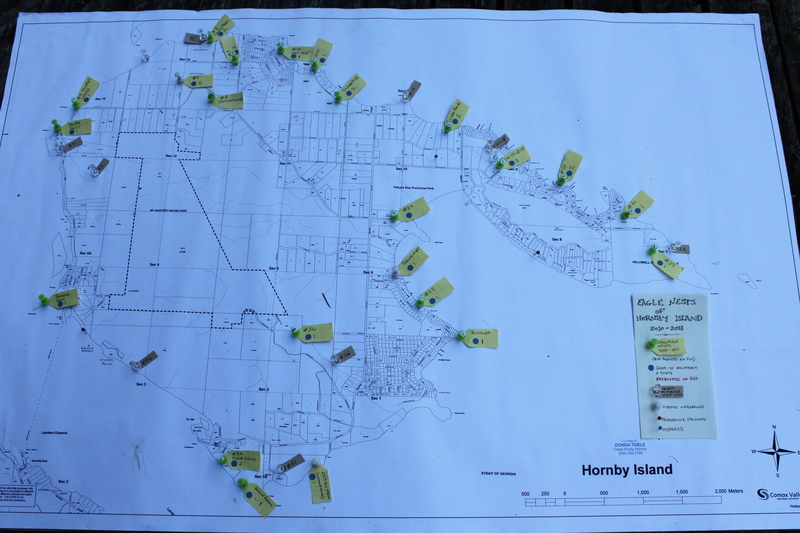 This map sums up our observations of the nests of Hornby Island for the summer of 2011. The information was collected from direct observation by Booni and myself, and from conversations with the nests' neighbours. Click on the map to see the larger size, and click again to explore details. From the Co Op parking lot i can tell that Mum Nest #24 is back again. She perches on the Nest Tree top & does a regular output of gulling. i*ve yet to hear another female go on the way she does. 'Tis the time of year to play Nest Divination. Question: is someone incubating eggs on this nest? 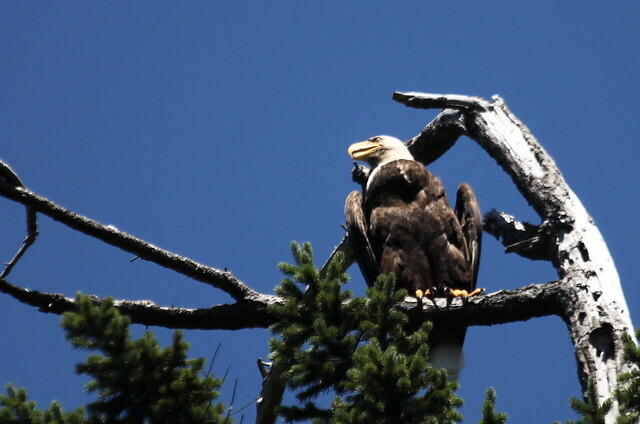 i spotted this Eagle air drying or sunning from the Co - Op parking lot! Notice how the belly feathers are all fluffed out & open. Beautiful! Did you remember what you were going to get at the co-op? I checked this nest today... First I saw an adult perched at the very top of the nest tree. He or she is in a very strange pose, wings half open to cool down. The crop is huge and we see strange bits of the body topography that we don't usually notice with the wings closed. The side lighting highlights the bumps and hollow. 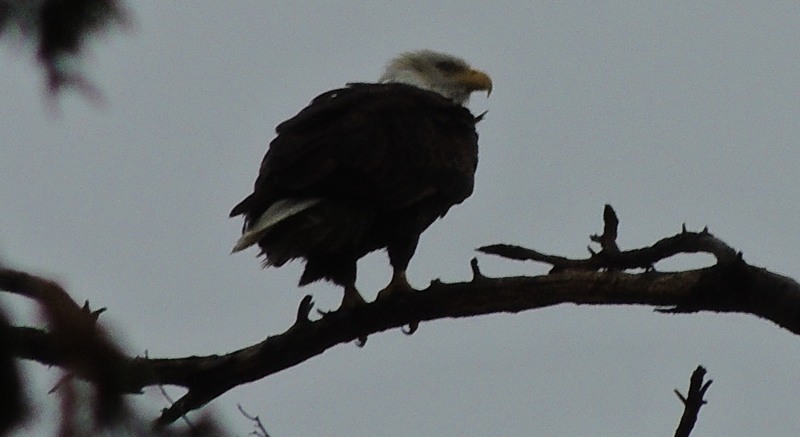 Also, this eagle's tongue is sticking out. It was a hot day. I got to within view of the nest and saw movement right away. One eaglet had just moved to a branch! Soon I spotted a second eaglet, who eventually climbed onto the nest rim. 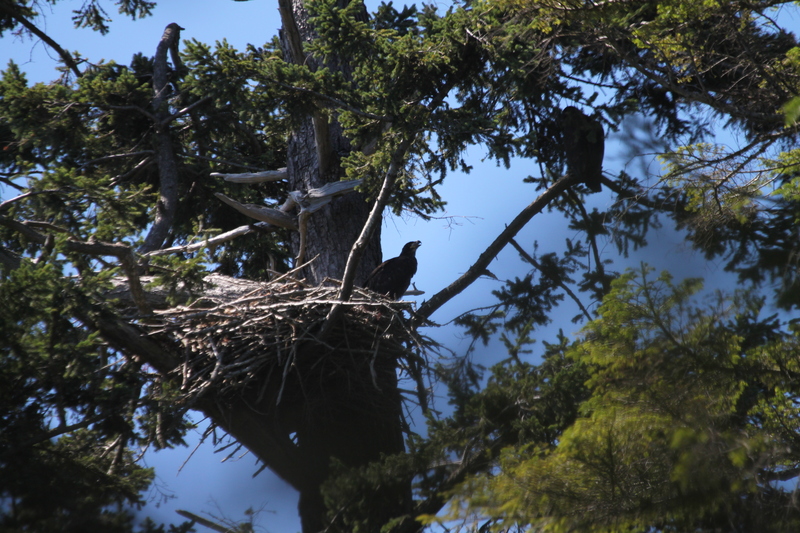 The photos are not very clear but you can see the full crop on the eaglet who's sitting on the nest. Wow, wonderful Wren - thanks! The story of this nest took an unforeseen turn today. Booni and I got a phone call for an eaglet down on the ground! I have posted the rest of the story under the MARS thread... Click here to see it. Yesterday i was away from home & it was lucky lucky lucky that i checked my messages. i had gotten a call from someone who works at the Co Op not three minutes ago. She was on a break, & was walking down the road past Nest #24 when an Eaglet came out of the woods & down into the roadside ditch. She said he was walking towards her! She said he was BEAUTIFUL, & she recognized that this was a young one, not yet ready to fly. This is a busy road this time of year, lots of cars & people going by on their way to lovely Tribune Bay beach. So she & another Co Op employee realized the need to direct people & traffic away from the young one, to protect him. The youngster was drawing a crowd of curious onlookers. She had called me from the Co Op, & i lucked out again that she was there when i called back to tell her i was on the way. Next step was to call MARS & report. i was in such a flap of fear & worry, i didn*t even recognize Maj on the phone! Meanwhile i am trying not to panic. i tell her i will report back. i stopped by where the Eaglet had last been spotted on my way home to get the carrier & some covers & a liner for it. They had left a big gap for me to park in the shade next to where this youngster was. & people were directing cars & walkers past the area. i said i was just checking in & would be right back. Then i dashed home to get the rest of my gear. When i got back there were less people & cars, fortunately. i was dreading being watched doing something i was not comfortable with, with a crowd watching. 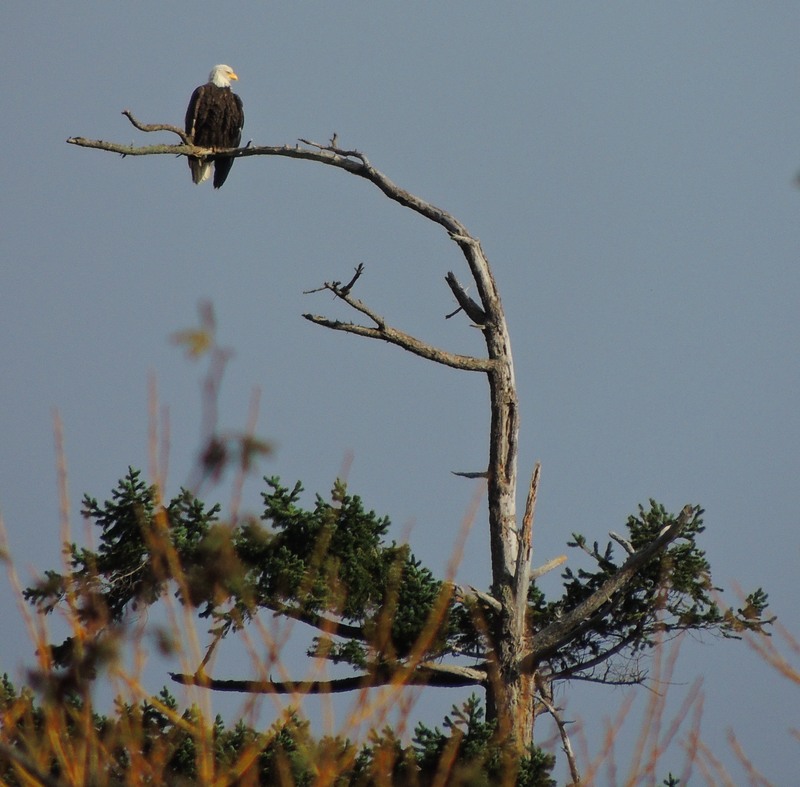 The Eaglet had fleaped out of the ditch & into the woods & brush below his Nest. So he wasn*t drawing so much attention. It was hot hot in the ditch, & a bit cooler where he was now, with wren quietly watching him from behind a tree. You could hear his sibling calling from the Nest. We decided that wren, since she was better dressed for bushwhacking than i was, would go around & approach him coming towards me from the other side. She had goggles & capture gloves & a net to help her. i donned my gloves & goggles & opened up my big capture towel. The fingers of the gloves seem so clumsy, & i worry my hands won*t work properly & gently enough. My heart is pounding with worry as i approach him. He looks about to leap, so i drop my eyes to the ground & turn sideways. Meanwhile i take some deep shuddering breaths. In my head i am talking to the youngster, telling him it*s okay, i won*t hurt him, i am only here to help, please let me capture you without hurting you, so that we can get you to help, then you can be returned to your family. 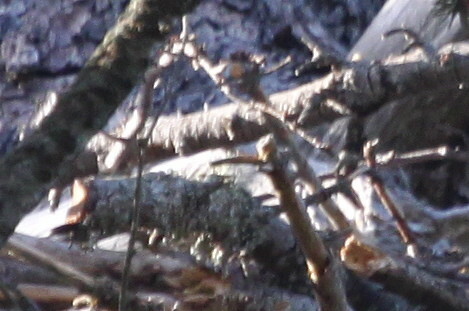 He is distracted by the crashing through the bush approach of wren from his other side. So when i see the back of his head, i creep closer. When he looks at me, i drop my eyes & turn sideways. Suddenly he leaps forward & comes up against a large dead tree lying on the ground. i am tempted to make a dash for him at this point, as the tree blocking his way would help me to capture him. Were i doing this myself, i would have gone then. But i decide to wait for wren to get closer to help me from the other direction. He has now leaped to the top of this downed tree & is perched there. i am not noticing any limping or any problems or unbalance in moving his wings, so i am hoping he is uninjured. He is watching wren & then watching me. i am only about three or four feet away from him & am examining him for parasites, which i don*t see. His nictitating membrane keeps blinking, moistening his lovely dark brown eye that i can now see up close. His lovely orange feet are stupendously bright & clean & soft-looking, & his talons are shiny new black. 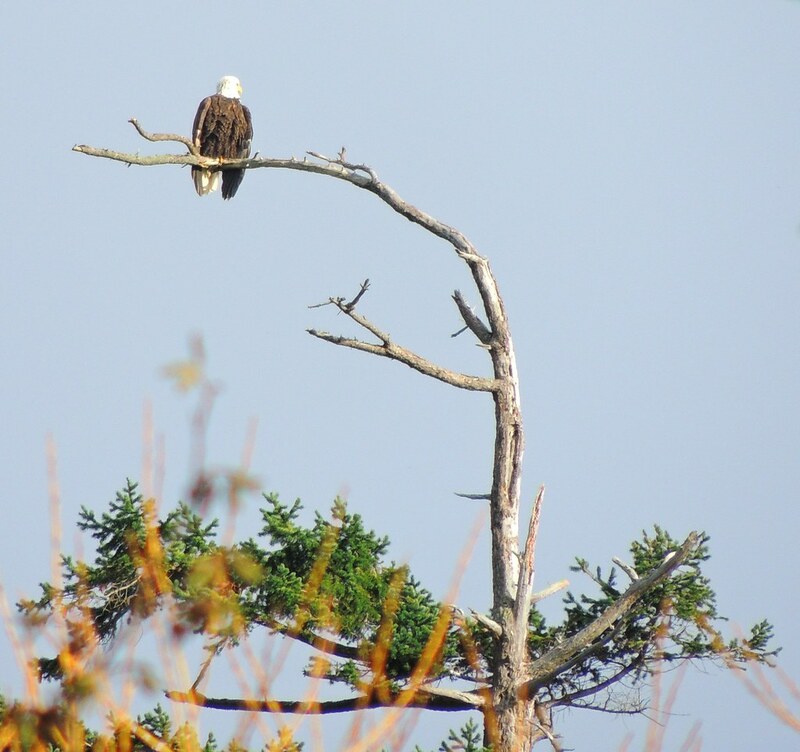 He looks so little compared to the other three Eaglets i have seen up close, Niner Brig & Decker. i can*t believe i am so close to him! Walk up to him & throw the towel over him? Just capture him standing right there? He takes the decision away from me by leaping forward & walking & fleaping towards the bush. Now is the time for action booni, so i go after him with my towel, wren coming in fast too. i figured he was gone, & we*d be chasing him through the bush now, but in flapping his wings, the poor fella got the bend in the wings hung up on some low bush branch he was heading under, going into the ferns. So i dove towards him, ignoring the scratching bushes, & quickly covered his head & back with the towel. i have a final glimpse of his lovely face, turned towards me with the beak wide open as i cover him up. i ask wren to keep the towel over his head while i untangle the wings from where they have stopped him by becoming hooked in the branches. i am supposed to get the feet under control first, but he seems calm with the towel over him so i free his wings, first right, then left, & fold them into his body as i reach for his right thigh. wren is keeping the towel over him, which is a HUGE help as it keeps my hands free to hold him, & keeps him calm by his being covered. i am able to pick him up & bring his back towards me against my chest, one leg in each hand, head under towel pointing away from me, tail hanging down towards my legs. & i didn*t feel like i*d hurt him with my lack of skill, this all went quite smoothly! We bring him out of the bush & to the waiting open dog kennel in the back of my van, which i had lined with a towel for him to grip with his feet. i ask wren to pull away the capture towel as i pop him into the kennel & this works well. All the adrenalin & rush comes now. As i take off my capture gloves, i realize i totally forgot how fumbly they were feeling. They did the job just fine! i take off my goggles & begin to feel tickling all over my arms. Oh, so there are parasites after all. i can feel them all over me, coming from the gloves & the capture towel. i swipe at them but they don*t come off. i know they won*t bite, & they also won*t last long without their Eaglet host. But the tickling drives me nuts, it is everywhere. wren offers to take him to Buckley Bay to meet the MARS vehicle. i am supposed to be at work. So back i go, & i am amazed to see that it was only an hour ago that i first got the message on my answering machine. Just as i am getting out of the car, the phone rings. It is Maj calling me back! She was thinking i had been trying to call her, & they had been using the phone the whole time, so i wouldn*t*ve gotten through to them. What luck that she called just then. So i told her we had had luck, & wren was on the way to meet them at Buckley Bay. 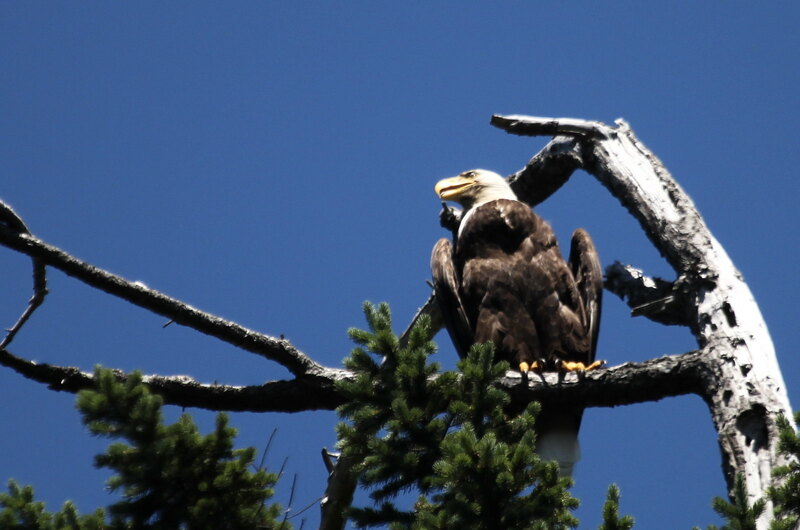 She was watching another Eaglet of close to the same age, with a similar accident, getting fed at MARS & doing well. i can*t wait to hear more about how this youngster is doing! Booni - you told this story so well! I think I was breathing with you - and I know I started scratching at the end! What a great job you and Wren do! Wow...catching my breath too! icky scratchy parasites! poor boy. Booni... what a story! Thanks a million to you and Wren for being there and being brave enough to attempt and succeed at these rescues!